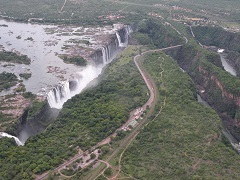 Dr Katharine Vincent is in Livingstone for two weeks as part of the assignment to support climate risk planning within phase 2 of the Pilot Program for Climate Resilience. The second phase of PPCR extends mainstreaming of climate resilience into local level policies and strategies, and supporting participatory adaptation and canal clearing in the flood-prone Bartose sub-basin. In conjunction with a local consultant, she is running a training of trainers course for Climate Resilience and Adaptation Facilitators and District Planning Officers, who will then facilitate gender-sensitive climate risk assessments in communities, and the identification and prioritisation of adaptation activities for inclusion in local level development planning.